HDFC Life, one of India’s leading private life insurance companies, announces the return of HDFC Life YoungStars Season 2 in partnership with VOOT – India’s leading Video-on-Demand platform from Viacom18. Conceptualized by Maxus for HDFC Life, this unique digital talent show for kids includes performances by children, between the ages of 6 and 14, in the popular categories of Dancing, Singing, Acting and Musical Instruments. The engaging show HDFC Life YoungStars Season 2, showcasing kids and their inspiring talent, is now streaming exclusively on VOOT. · Leslie Lewis of Colonial Cousins fame will be mentoring the budding musicians. 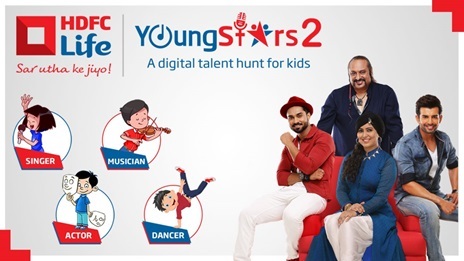 YoungStars Season 2 aligns to HDFC Life’s digital first focus and VOOT’s vision of curating innovative content experiences. Parents uploaded their child’s video clips on the YoungStars microsite, which were then shortlisted. The selected children will get mentored by the celebrity judges, who will nurture their talent in the field of their choice. The finale will include a faceoff between the finalists and the winners, who will be adjudged ‘HDFC Life YoungStars’ and will get the opportunity to perform with the celebrity mentors. HDFC Life YoungStars 2 is now streaming exclusively on VOOT. Established in 2000, HDFC Life is a leading long-term life insurance solutions provider in India, offering a range of individual and group insurance solutions that meet various customer needs such as Protection, Pension, Savings, Investment and Health. Customers have the added advantage of customising plans, by adding optional benefits called riders, at a nominal price. As on June 30th, 2017, the Company has 31 individual and 10 group products in its portfolio, along with 8 optional rider benefits catering to a diverse range of customer needs. HDFC Life continues to benefit from having a wide reach with 414 HDFC Life offices in Indiaand 12,000+ distributor touch-points. The Company has a strong base of Financial Consultants. The Company has also recently completed incorporation of its wholly owned subsidiary in Dubaito offer reinsurance services. For more information, please visit our website, www.hdfclife.com. You may also connect with us on Facebook, Twitter, YouTube, LinkedIn, and Google+. VOOT is a digital video-on-demand platform from the house of Viacom18. With a content library of over 35,000 hours across Viacom18’s network content, content around content, VOOT Kids and VOOT Originals, the platform caters to varying needs of discerning audiences across segments. Operating currently as an ad-supported service in India, VOOT has amassed 33 million app downloads and over 20 million monthly active users. With a daily user base of over 2.2 million, VOOT has also been awarded the coveted ‘Best app of 2016’ title by Google Play. In addition, VOOT’s Progressive Web App (PWA) project has been recognized as one of the top global innovations of 2017 by International Broadcasting Convention. VOOT continues to take the leadership mantel on innovation, for both content & product features, aimed at providing an immersive experience to its users.